Paw Print Genetics - Why Do My Dog’s B Locus Results Say ‘maybe black or brown’? For most genes in the dog, there are two copies of that gene, one inherited from the mom and one inherited from the dad. The B locus is no exception in that although both parents have two copies of the B locus, the mom contributes only one copy of the B locus to each of her pups, randomly selected from her two B alleles that she carries, while the dad also randomly contributes one copy of B locus to each pup in the same manner. For the B locus, the two copies of the gene that are inherited from the parents may carry no variants of bc, bd, or bs, may have one copy of either the bc, bd, and bs variants, two copies of any of these variants or all three variants. A brown coat, nose and foot pads only result when at least one of these DNA changes is present on both copies of the B locus. If one parent does not contribute a B gene with at least one of these variants, the dog cannot have brown pigment. Figure A represents two copies of the B gene with no variants present at any of the three loci. Dogs with no variants on either copy of the B locus have a B/B genotype. Dogs that are B/B at the B locus will have a black coat, unless they are also e/e at the E locus, and then they will be yellow. Figure B shows two variants, but both variations (shown in this example as bc and bd) are found on the same copy of the gene (meaning that they were inherited from only one of the parents). A dog carrying two of the variants, but on the same copy of the gene, is a carrier for brown (brown factored) and will not exhibit a brown coat color. Dogs with variants on a single copy of the B locus (inherited from one parent) have a B/b genotype. Dogs that have a B/b genotype at the B locus will have a black coat, unless they are also e/e at the E locus, and then they will be yellow. Figure C also shows two variants, but in this case, each copy of the gene has one of the variants (meaning that one parent contributed the bc variant while the other parent contributed the bd variant). This dog would likely have a brown coat color (depending on the specific genotypes at other genes such as E locus) and would have a brown nose and brown footpads. Dogs that have a variant present on each of their B genes have the genotype b/b. Because of the complexity of the B locus and the genetic methods used, when there are two different b variants identified (bc, bd or bs), it cannot be determined if both variants are present on the same copy of the B locus (i.e. 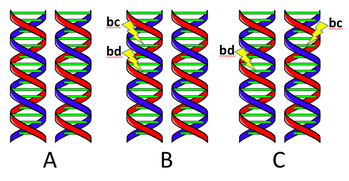 a B/b genotype) or are present, one on each copy of the B locus (i.e. a b/b genotype). Thus, due to the particular combination of variants detected in a dog, the overall B locus genotype of a dog found to have two different variants (bc, bd or bs) could be either B/b or b/b and cannot be determined without additional testing of parental samples. Therefore, the interpretation of such a result is that the dog carries brown and may have brown or black coat, nose and foot pads. If the b variants each occur on separate copies of the B locus (as shown in Figure C), the dog will be brown (b/b). However, if these variants occur on the same copy of the B locus (as shown in Figure B), the dog will be black (B/b) (if EE or Ee at the E locus or yellow if ee at the E locus). Therefore, the final B locus genotype for a dog with this genotype can be inferred by evaluating the color of the dog’s nose. If the dog’s nose is brown, the final B locus genotype of the dog is b/b and this dog will contribute ‘b’ to 100% of its offspring. If the dog’s nose is black, the final B locus genotype of the dog is B/b and this dog will contribute ‘b’ to 50% of its offspring and will contribute ‘B’ to 50% of its offspring. If a dog is B/b it can produce offspring with a black or brown coat, nose and foot pads depending on the dog that it is bred to. As with all color testing, a dog’s ultimate coat color is dependent on many genes including the E, K, and A loci. Paw Print Genetics offers a comprehensive menu for color testing and has genetic counseling available prior to ordering (pre-test counseling) or after you have received your results (post-test counseling). We are committed to helping you understand the genetics of your dogs and how genetic testing can be used to improve your breeding program. You can contact us at AskUs@pawprintgenetics.com or call us toll free (US and Canada only please) 1-855-202-4889 or direct at 509-483-5950. We look forward to helping you with your coat color testing.